It was just a little room with a few wooden benches and red paint on the clapboard walls, and the men who used to crowd in there were certainly no cutting-edge scholars by most any standards. They took their lessons from a guy named Orson whom they’d elected to the position from within their own group, although they did collaborate with a local college to hire an honest-to-goodness professor for some classes in Hebrew. But their main teacher—their colleague—was only a retail clerk. So this was not a center for academic rigor. But a full six years before the launch of what Boston University School of Theology claims as its foundation, another “school of the prophets” organized in Kirtland, Ohio. When I first learned that BUSTH labels itself “the school of the prophets,” I laughed. The phrase comes, I know, from the Bible, and even places like Harvard and Yale have attached themselves to the title over the years. But for me, the School of the Prophets has always conjured images of that unassuming gaggle of guys huddled in the second-story room of the N. K. Whitney & Co. store in northern Ohio. “And I give unto you a commandment that you shall teach one another the doctrine of the kingdom. Teach ye diligently and my grace shall attend you, that you may be instructed more perfectly . . . in all things that pertain unto the kingdom of God, that are expedient for you to understand; Of things both in heaven and in the earth, and under the earth; things which have been, things which are, things which must shortly come to pass; things which are at home, things which are abroad; the wars and the perplexities of the nations, and the judgments which are on the land; and a knowledge also of countries and of kingdoms—That ye may be prepared in all things when I shall send you again to magnify the calling whereunto I have called you, and the mission with which I have commissioned you” (Doctrine and Covenants 88:77-80). So under that injunction, on 23 January 1833 the School of the Prophets began what turned into a singular experience. The school ran for only a few months, but oh, what a few months they had! In the adjacent room, Joseph Smith received revelations about how to run the LDS Church, and some of the most idiosyncratic traits of Latter-day Saints—including their avoidance of coffee, tea, alcohol, and tobacco—came as the result of the things Smith wrote and taught there. The Church’s emphasis on lay leadership can trace its roots to the School of the Prophets. And while in classes in that small room above Newel Whitney’s store (Bishop Whitney attended the lessons as one of the Church’s leaders himself), the men claimed that angels appeared to them. So, they said, did God. On day five of our week-long move from Provo to Allston, my husband and I tweaked our route a bit so we could swing by Kirtland for a visit. Neither of us had been there, but we’d both grown up hearing the stories. Both Nathan and I had attended LDS seminary as high school students. Both of us had served full-time missions where we taught people about Jesus and the Book of Mormon and modern-day prophets. Both of us had graduated (twice, in Nathan’s case) from Brigham Young University. And we had been married in an LDS temple. And now we had crossed the bulk of the country en route to Boston so I could start a master’s program as a Mormon in the United Methodist Church’s oldest American seminary. I was apprehensive. My decision to study theology had not come easily, and I still wasn’t convinced—in spite of numerous indications I could only interpret as signs from God—that I’d made the right choice. Second-thoughts plagued my mind for the bulk of the journey, even as we rolled into Kirtland. 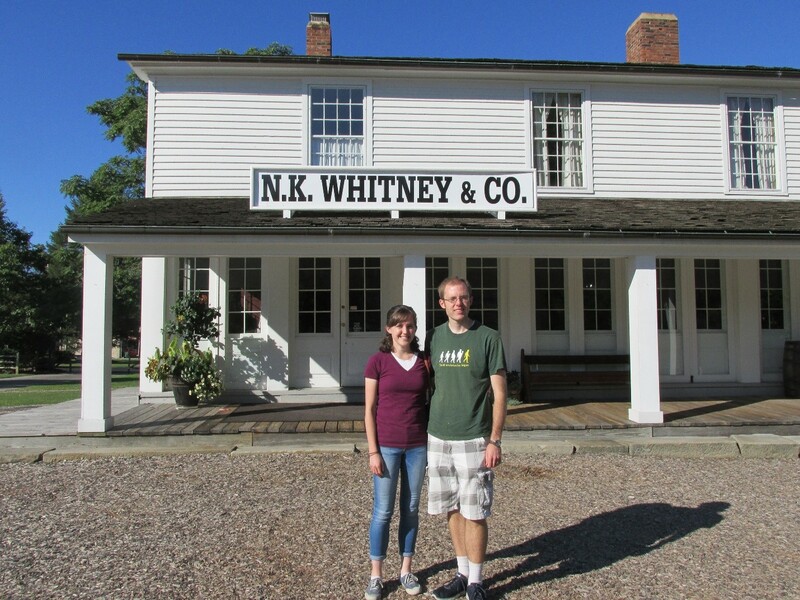 At the Kirtland Visitors’ Center a companionship of sister missionaries toured us around the Newel K. Whitney store, and then they led us up a narrow flight of stairs to the wooden red room that had housed the School of the Prophets almost 184 years earlier. I couldn’t help but smile as I sat on one of the benches. This was the School of the Prophets, I thought, and now you’re off to a school that calls itself by the same title. But behind the smile, trepidation still sat on my thoughts. Was I doing the right thing? Had God really approved my decision to pursue graduate studies in theology? Would Nathan be able to find work so we could survive in such an expensive city? Would we be okay? Would my faith grow, even if others challenged my beliefs? As my mind rolled over the uncertainties, the sister missionaries began telling me and Nathan about some of the visions the School’s pupils had claimed. I listened intently and tried to picture angels in the little red room. Then, with a soft voice, one of the sisters reiterated the story that God—all humanity’s divine, embodied Father, according to LDS theology—had appeared in the School of the Prophets. God was here, I thought, and I ran my fingers over the wood of the bench. Sacred warm reverence hugged my heart, hushing the fears in my mind. If He cared enough about the uneducated fellows who crammed into a red room at the top of a store in Ohio, then surely He cared about his nervous young daughter en route to grad school in a new place and a new field of research. At sunset that evening, Nathan and I piled back into our rental Budget truck and we shared a sandwich before setting off on the last leg of the trip before we could call it a night. We didn’t quite know all the trials we would face over the next few months—financial instability, emotional breakdowns, hope deferred, paper deadlines, and such—and we certainly didn’t know that most of our fears would resolve. But we did know that we’d felt something special in the little room with red clapboards and stiff, wooden benches. We’d breathed the musty air of a room God once stood in, and with that air still tracing our lungs, we launched forward with faith. Enough faith to carry us through. Greer Cordner is a first-year Master of Theological Studies student and focuses her research on the history of Christianity. She also enjoys writing, art, and Russian literature. Although there is much she likes about living in Boston (especially all the history! ), she misses the mountains of her native Orem, Utah.